Which Florida Water Park Has the Most Thrilling Slide? 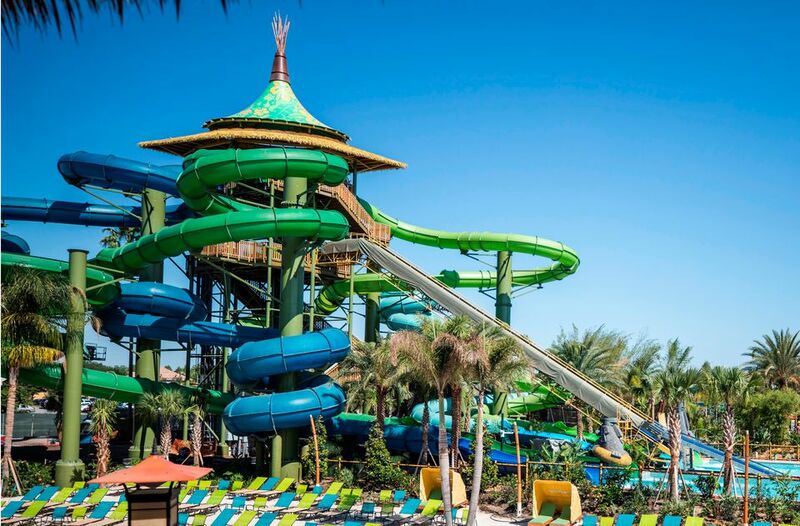 Florida Water Park Smackdown: Who Has the Most Thrilling Slide? People visit water parks for a variety of reasons. For example, many seek relief from the heat and humidity. Others want to frolic in lazy rivers and wave pools. And some enjoy hanging out by the water and catching some warm-weather Zs on lounge chairs. But like their amusement park counterparts, a lot of folks head to water parks in search of thrills. There are many water parks in Florida. The ones operated by the major theme parks in the Orlando area, however, are among the best in the world. And when it comes to thrills, the big-name parks in Central Florida have some of the most nerve-wracking water slides on the planet. Which ones elicit the most panic-stricken screams? Let's evaluate the most extreme attractions at Florida's water parks. Like its sister parks, SeaWorld Orlando and Discovery Cove, Aquatica has a marine life theme. In addition to water slides and other more conventional water park attractions, the lovely park includes live animals. But it doesn't skimp on the thrills. Among its more wild rides are Ray Rush, a multi-element slide that includes an enclosed sphere and a halfpipe wall, Dolphin Plunge, a speed slide that races through an underwater tube and past Commerson's Dolphins, the triple-drop HooDoo Run, and Omaka Rocka, a mini funnel ride. The most intense ride at Aquatica, however, is Ihu's Breakaway Falls. Guests choose one of three drop capsule slides (a fourth slide foregoes the capsule). When the trap doors open, they are launched into enclosed tubes that start with steep drops and then take winding courses. Thrill factor: The launch capsules add an element of surprise and excitement, and the initial drops, which are quite steep, can be unnerving. But at a "mere" height of 80 feet, Ihu's Breakaway Falls is not as fast or long as the slides at other Florida parks. Typhoon Lagoon boasts Humunga Kowabunga, a potent speed slide. But Disney World's other water park, Blizzard Beach, takes speed slides to a different level with Summit Plummet. At 120 feet, it is more than twice as tall as its Typhoon Lagoon counterpart and is one of the tallest, fastest, and steepest water slides in the world. At the bottom of Summit Plummet, there is a digital readout that displays each slider's top speed. It varies according to the weight of the riders and other factors, but most adults hover just above 60 mph. For a water slide, that's fast. It is so wild, we rank it as the most thrilling attraction at Walt Disney World. Thrill factor: It doesn't get much more thrilling than this at water parks. It takes a lot of nerve to climb to the top of Mount Gushmore and launch oneself over the precipice and down Summit Plummet. With crazy coasters such as Hollywood Rip Ride Rockit and The Incredible Hulk, Universal Orlando isn't shy about incorporating major-league thrills into its attractions. And major-league thrills are certainly featured at the resort's water park. Rides such as Honu of the Honu Ika Moana and Ohyah & Ohno Drop Slides include heart-pounding features. But riders' hearts really get pounding on the three water slides tucked inside the park's centerpiece Krakatau Volcano. One of them, the Ko'okiri Body Plunge, is a speed slide that drops nearly straight down like Disney World's Summit Plummet. The other two are Serpentine slides that take a more winding route. But all of them start at the 125-foot level of the volcano. And, like Ihu's Breakaway Falls at Aquatica, all three of the slides begin with launch capsules. Thrill factor: As we noted above, water park rides don't get much more thrilling than Summit Plummet at Blizzard Beach. But Volcano Bay's trio of slides accomplish the feat. With the combination of the launch capsules, the extreme height (Universal's slides may only be five feet taller than Disney's slide, but they somehow seem way more out of control), the nearly vertical drops, the blistering speeds, and the disorienting, almost lights-out journey through the enclosed tubes inside the mountain, these are the most thrilling water park slides in Florida—and the most thrilling in the country for that matter. Looking for Water Parks? Start Here.